Brandon Finnegan tweaked his changeup late last year, and the result was a significant boost to his overall game. Eno Sarris detailed how he threw it more while taking some zip off, widening the velocity gap between it and his fastball to about 10 mph. That led to an ERA well below three and a strikeout percentage of 30%, which are very baller numbers. I don’t think it was just the velo difference that led to Finnegan’s outstanding results, though (I don’t think that’s what Sarris was saying, either). The pitch seems to have totally changed. Like, new address, new clothes, new cologne. New everything. It didn’t just get slower. It became less erratic, less a noodle and more a frozen pea. It reminds me of when Cole Hamels wrangled his own changeup, where it went from seducing hitters with its movement to stifling them with its precision. I’m not saying Finnegan’s change now mimics that of Hamels, but it certainly became more wily at the end of last season. The trajectory of it makes it look like it’s straight and narrow, right? And by itself, it is. 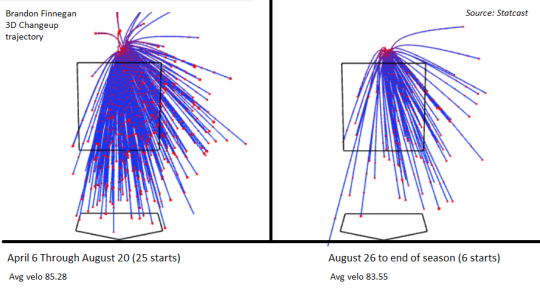 It stands to reason that if Finnegan threw the changeup with more consistent trajectory, that it was located more consistently as well. That’s what appears to have happened. In the scope of sequencing his pitches, that’s extremely important, because it means he could rely on it more while hitters could accordingly rely on it less. Finnegan turning down the velo and fine-tuning the location of his changeup are good things in a vacuum. But what those adjustments really did was make the pitch more closely resemble a four-seam fastball, and one left up in the zone, at that. He took his changeup and made hitters think it was a mistake. They accepted it graciously until it was too late. The results were essentially the same as when Lucy pulls the football out from under poor old Charlie Brown. It’s important to acknowledge sample size here — six games isn’t much at all. But the adjustments produced results that should certainly encourage Finnegan to keep the altered approach with his changeup from the end of last year. What I’m curious about is how he builds off of this. Only three other pitchers in the majors last year threw at least 2500 pitches between their four-seamer, sinker, slider, and changeup: Ervin Santana, CC Sabathia, and Chris Archer. Finnegan used his changeup more than them all year long, but that’s especially true from the end of August through season’s end. It was also the best of the group — by nearly three runs per 100 thrown! 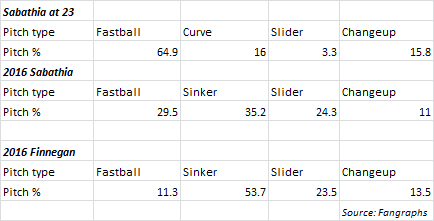 Archer and Santana don’t throw a sinker, which leaves only Sabathia as a comparison for Finnegan through this context. There isn’t necessarily a lot that makes the two comparable aside from their arsenal, but there might be something Finnegan can learn here from his elder statesman. He threw a fastball at a nearly identical rate as Sabathia did at his age. (Sabathia also wasn’t throwing a sinker yet, which was another step in his evolution.) This doesn’t speak to any grand finding, but it does acknowledge a pitcher’s youth. As time moved on, Sabathia learned to rely on his fastball less and less — 13 years later, he was throwing his four-seamer nearly 35% less often. In the case of Finnegan, he might take an additional step by relying on his sinker less and less, and, given the way his changeup fools hitters, he might benefit by throwing more four-seamers. Maybe it’s intuitive that a pitcher should better balance his offerings to make himself less predictable. That doesn’t mean he’s going to figure it out, though. In terms of adjustments, baseball is paradoxically a game of “dance with who brought you” and “tinker ‘til you’re at the top.” Brandon Finnegan already seems to be getting more confident with the idea of tossing his pitches more equally. But it could also indicate advancing beyond what got him to the majors, to where he’s finding what can keep him there for a long time. The work he’s put into his changeup is just the first step. We hoped you liked reading Brandon Finnegan’s Changeup Adjustment by Tim Jackson!